Ham and cheese crepes are a delicious, savory lunch or light dinner. 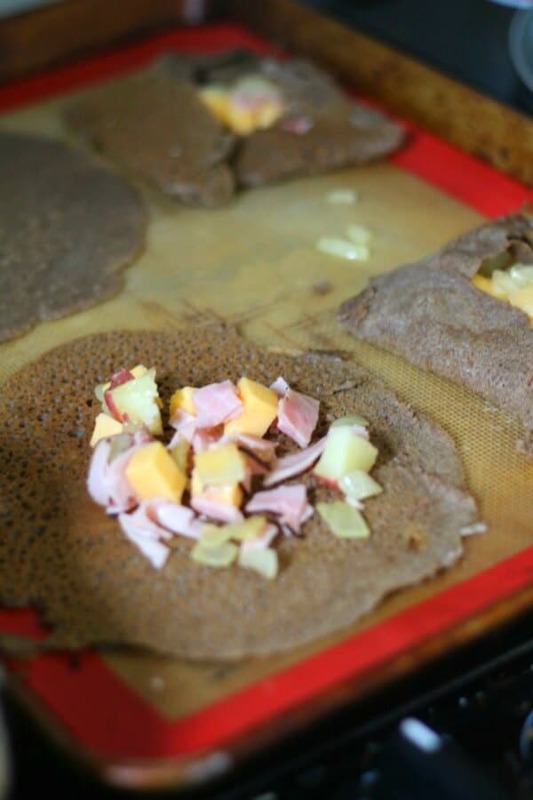 Ham, smoked Gouda cheese, onions, and potatoes are folded into a nutty buckwheat crepe for an authentic French dish, Galette Raclette. This is the second recipe in the French series based on my vacation in France. If you are in a hurry click here to go straight to the ham and cheese crepes recipe. Remember, these recipes and highlights of my trip are not in chronological order! I am just making whatever I feel like making every week. Today’s ham and cheese crepes recipe is from Normandy. 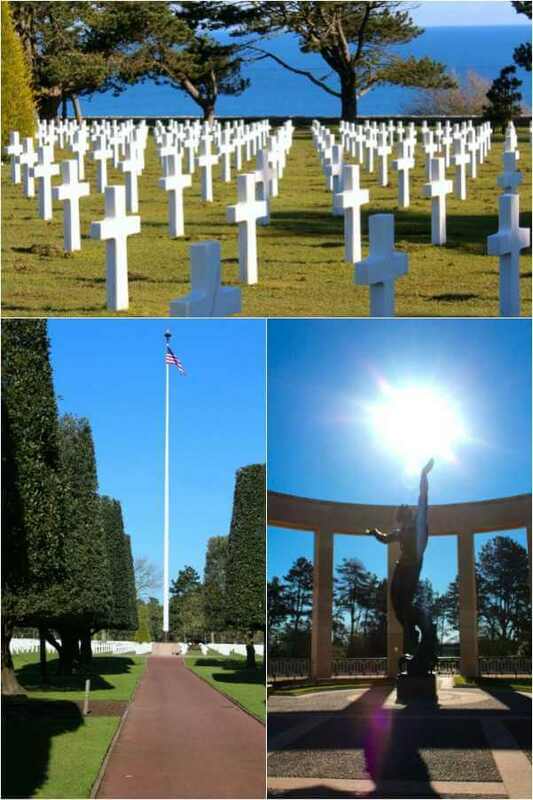 Normandy was one of my favorite, and most emotional, stops. 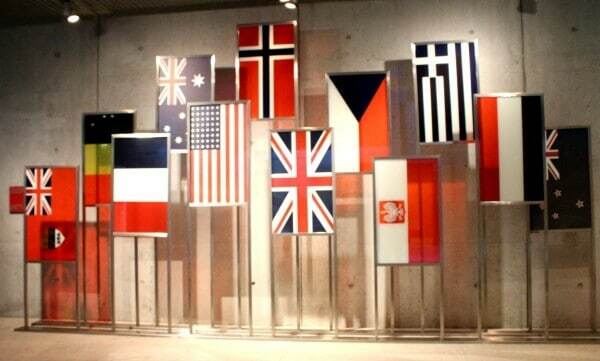 Having been in the military, having had a father and several uncles that served in World War II, and having three sons in the military pretty much guaranteed that the American Cemetery at Omaha Beach was going to be rough for me. Let’s face it, y’all, I cried at the Alamo. My kids tell everyone that I cry at the opening credits of movies, which is ridiculous. I did cry at The Lorax though. So I knew what to expect and my husband knew what to expect. We were prepared. Sort of. To get out to the park area that overlooks the landing beaches you first watch a short video presentation about what happened on that day. I carefully skirted that and started ambling through the museum which was full of memorabilia, uniforms, and a variety of other things. I did OK for a few minutes but I could feel myself tensing up. Once you go out the doors you can’t come back in and I forgot to tell my husband I was leaving the building. As I walked through those doors I was struck by the beauty of the spot — the deep blue sky, the emerald green grass, the trees with their tiny, baby leaves swaying in the breeze. And, in the background of it all, the ocean. Sparkling and blue-green, the salty-fresh scent wrapped around me as I walked toward the overlook. Looking down I saw the beach. Not just a beach but THE BEACH. The sand was white and the waves were gently lapping at the shoreline but in my mind I could hear the weapons and the shouts of that long ago day. I could see the pristine sand begin to turn pink and then red as it absorbed the blood of so many men — men who were real and had families and hopes and dreams. Men who liked to take walks, read books, smoke pipes, and drink beer. Men who had stepped out of their real lives and into Hell so that I could enjoy all of the freedom I enjoy today. And the tears just started flowing down my face and the mascara came right along with it. Nothing like going to France and spending a morning looking like Alice Cooper after a particularly energetic concert. And in that moment I knew that “I know you” is an even deeper way to say, “I love you”. I blotted my face, smearing my mascara even more, and tried to regain my composure. I have learned that even expensive water proof mascara is no match for the torrent of water that can spew from my eyes at any given moment but that once it has left my eyelashes it becomes like permanent marker on my face. Go figure. We strolled up the path and gazed out of the thousands of graves, most marked by crosses but some marked by the Star of David. I seem to remember that our tour guide told us the the cemetery held only about 30 percent of the people that died there. The other 70 percent’s bodies were sent home for burial. Leaving there I felt like I had been at church. I left with a deep peace that I can’t explain. We were staying near Mont St Michel that night and the ride there was quiet. I looked out the window and noticed fields of yellow flowers. I thought they were mustard but I was told it was canola. I will tell ya, I don’t much like canola oil but the flowers are just beautiful! As we neared Mont St Michel we could see the monastery in the distance. The bus driver pulled onto a small road and then into a pasture so that we could get some pictures from far away. 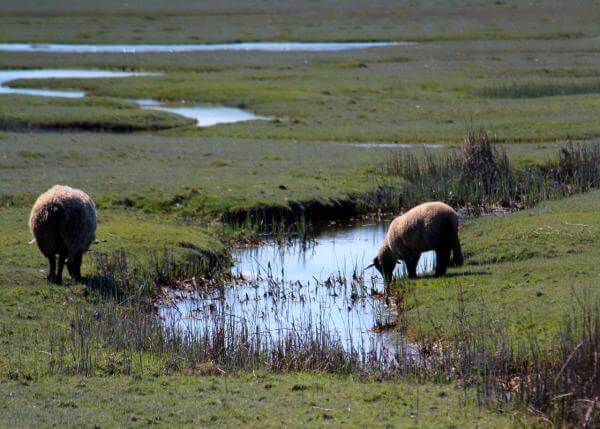 In the pasture were sheep and I as I was snapping pictures of the monastery I happened to get a few shots of the sheep. It was another one of those moments for me as the 23rd Psalm ran through my head. 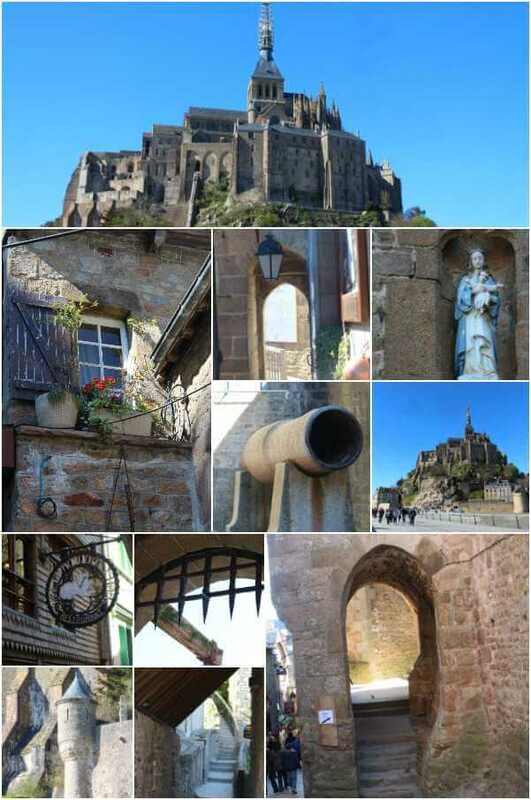 Mont St Michel is a huge monastery build on a rock that becomes an island during high tide. The narrow, cobbled street winds around and around, always going up, with shops and restaurants on either side. You can climb stairs to walk the walls like guards would have centuries ago and you can walk up something like 300 stairs and tour the monastery itself. We walked the walls but not the monastery. I am too clumsy and I had visions of myself rolling down those 300 stairs! The abbey was built in the 11th century. There is a long bridge now but in the past there wasn’t and when the tide came in Mont St. Michel became an unreachable island. Because of this it was never conquered. As you go in through the heavy doors you can see a battering ram that was just left there when the attackers figured out they weren’t getting in! In the image below it looks like a canon. That evening we ate at a restaurant that was associated with the hotel. The galette is a regional dish and I was definitely trying to eat foods from the different regions. I found that here in Normandy savory crepes are referred to as galette and the sweet crepes are crepes. The galette was made with buckwheat flour and it gave the dish a nutty flavor that I really liked. I chose the galette raclette a specialty of the area. It was a huge buckwheat crepe filled with potatoes, melty cheese, and ham. Yep, just simple ham and cheese crepes! Don’t stop there, though. Ham and cheese crepes are great but you can put any kind of filling in there you like. You might also want to top these with a poached egg just before serving. It was folded into a square with the filling peeking out and was very pretty — not at all what I think of when I think of a crepe. It’s super easy to make once you get past the crepes — they can be a little tricky but here are some tips to help you get through it unscathed. Let the batter stand for an hour after you’ve made it. This helps any gluten to relax. Use a nonstick pan or a heavy, well seasoned iron skillet. Heat the pan slowly over medium heat until it is very hot. Rub butter to coat the pan. Pour about 1/3 cup of the batter into the pan tipping it to coat the bottom with a thin layer of batter. You’ll almost always have to throw the first one out. Cook the crepe until the edges begin to curl up and pull away from the pan and the top is dull. Pull the edges gently up, slide a spatula underneath and remove the crepe from the pan. Store crepes in the refrigerator or freezer with waxed paper between each crepe. If it sticks to the pan you pan is not hot enough, you haven’t buttered it, or the crepe isn’t cooked all the way. If you are going to make these ham and cheese crepes often get this electric crepe maker! No questions about when the pan is hot enough, no sticking. 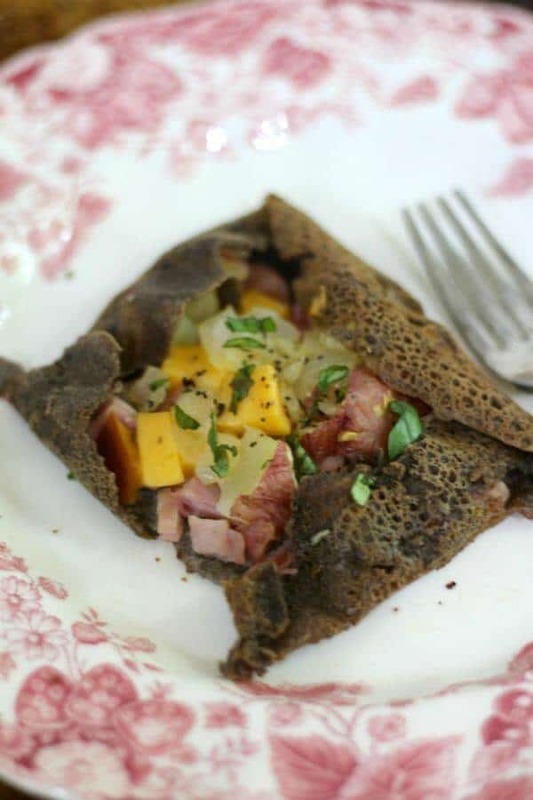 Buckwheat flour gives these ham and cheese crepes their unique flavor. Here’s the recipe for ham and cheese crepes. Enjoy! 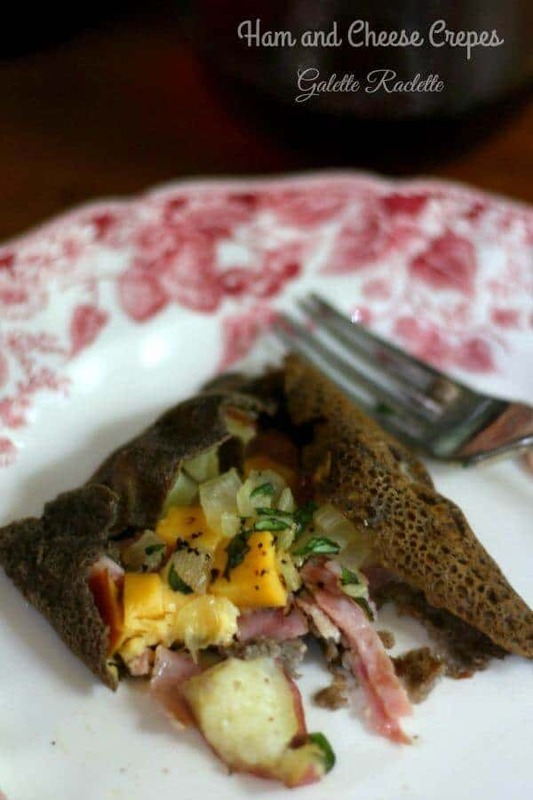 Ham, smoked Gouda, potato, and onions are folded inside a buckwheat crepe and baked until the filling is hot. A version of the Galette Raclette in France. Put the flour, 3 cups of water, salt, unsalted butter, and egg in the blender. Place in the refrigerator for an hour or up to 8 hours. When ready to cook heat a heavy, nonstick crepe pan over medium heat until very hot. Lightly grease the pan with melted butter, wiping out excess with a paper towel. If the batter has gotten too thick thin it with some of the water. It should be the consistency of heavy cream. Pour about 1/3 cup of batter into the pan, tilting the pan to cover the bottom with a thin layer of batter. Cook 2 minutes, or until the bottom is golden and the edges curl away from the pan and the top is dull. You can flip and cook a little longer or just remove the crepe from the pan. Keep the crepes in a stack with waxed paper or parchment between them until you are ready to fill them. Saute the onions in the 1tablespoon of butter until they are tender. Add the potatoes and saute briefly. Place 1 crepe on a flat surface. Place some of the ham in the center of the crepe. Add some of the cheese, then the onions and potatoes. Fold the sides over the top of the crepe leaving an open square in the center. Place the crepe on Silpat or parchment on a baking sheet. Pour 1 tablespoon cream into the open spot on the crepe. Repeat with the remaining crepes. Bake at 375F for about 2 minutes, or until the filling is heated through and the crepe is crispy. Delicious! I miss France for this very reason…haven’t had them for awhile. THANK YOU FOR SHARING YOUR FAVORITE MOMENTS WITH FOOD from your France trip…photos were great! What a great trip, and so meaningful too. I come from a military family, when my daughter joined I was super emotional. There’s just something about the services, and the cemeteries that touches you, knowing how much sacrifice has been made. It’s hard not to get choked up. On a lighter note the crepes are fabulous and the perfect way to kick off a busy day. Thanks Kim. 🙂 Yep it was a life changing moment for me. Thanks for sharing your thoughts about Normandy, Marye. Beautiful pictures and this recipe looks absolutely scrumptious! Gorgeous recipe Marye, and thank you for taking us along on your trip. I would be a mess at Normandy too. We are so incredibly blessed my friend. I got goosebumps as I looked at your pictures of the cemetery. I think anyone would shed a tear about the huge lose of human life there. Heart wrenching. As for your crepes, I love that you used buckwheat flour. It is a flour I have wanted to experiment more with. That’s how they were made in Normandy. I’d never seen them made like that but they really are good!